Facebook tells me it was four years ago today that I gleefully posted this photo of our first business card. A former name and a former logo but the same dream. The subtext of the card proudly read “A quality health center serving the uninsured and under-insured in the greater Phoenix area”. Having our own clinic was a dream – just an imaginary place. But the cards were tangible and that alone felt exciting. Yet as much as we believed in that dream, our goals looked so far away. Then something amazing happened. You all began to believe in this crazy idea with us. And together, we started talking about this dream as if its fulfillment were inevitable. And some sort of weird magic happened, where dreams were transmuted into plans, and plans evolved into committees and work parties. And before we knew it, we were looking at real-estate, doing health-fairs in the Workers Rights Center, and entering patients into our very own electronic medical records. Some of you remember those early health fairs. Those who weren’t there have probably heard stories about how precarious it was – blood draws in the kitchen, consults in the giant bathroom, and more. As inadequate as that all sounds, we were somehow getting it done – people whose diabetes had gone untreated for years were getting labs, medications, and follow-up. It was far from ideal, and sometimes less than dignified, but our neighbors needed healthcare and we were determined to deliver it. We continued those health-fairs for about another year, eventually moving them out of the Workers Rights Center, and into the gymnasium of a church in Maryvale. We helped a lot of patients through those health-fairs, and we felt good that we were providing the healthcare that so many needed. But our patients deserved more. They deserved to be treated with dignity and receive the highest quality of care we could offer. As hard as we were trying, it was hard to meet those needs in the space we had. I remember the day Amy & Bob bought that nasty, old squat on Roosevelt. Amy promised that we could make it beautiful, but all I saw were millions of cockroaches, and all I smelled was… well, I’m not going to describe the smell. But it was our very own space, and that was exciting. When Amy said it was salvageable, I held my nose and chose to believe her. And then, you all came around and chose to believe in the dream as well, and once again, your belief and hard work made it real. Stanky carpets were cut up & dragged out, walls were torn down and put up and painted. Before I knew it, the PACH House had become a haven – a place of love and hope and possibility. You brought all your knowledge and intention and relentless determination. Together we learned how to make it work. The PACH House was always crowded, but it was a sweet and dignified place. With its hardwood floors and homey feel, it provided a safe and welcoming space from which to launch a revolution. I could write a thousand blog posts about all that happened there. The PACH House was a place of love and intentionality, but damned if we weren’t sometimes crowded. And it wasn’t long before Amy and Bob started hunting for a bigger space. When they first told the board that they had found that space, I wasn’t too impressed with their choice. It felt industrial and cold, nothing like the warm feel and hardwood floors of the place we had grown to love. 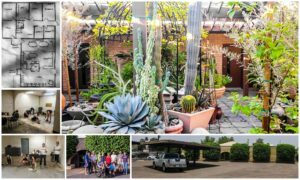 But just as with the run down house that had become our beloved clinic, Amy worked her magic on that cold, windowless warehouse of a building, and somehow turned it into a place every bit as warm and inviting as the original PACH House. The new clinic at 2902 W Clarendon is a place of dignified peace. A place of healing, learning, and collaboration. It’s the kind of clinic that our neighbors deserve. Today; exactly four years to the day after the first batch of business cards printed for our imaginary clinic, you all showed up again to help us move into this new space. Four years is not a long time for such a journey. But here we are. Thank you all for believing in us. Thank you for supporting us. Thank you for fighting alongside us for our patients – for the chart reviews and the long clinic days, and the house calls and the love and hope and courage that you have all brought to bear. I’m proud of you, and of us, and of our community. But most of all, I feel proud to be a PACHista.